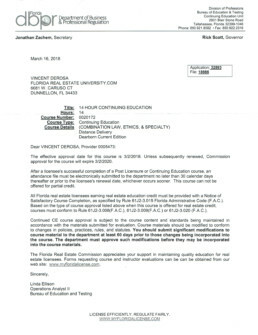 The ON DEMAND 14-hour Florida Real Estate Professionals Continuing Education Course has the most recent changes to Florida law and FREC rule changes. Real estate brokers and sales associates must complete 14 hours of continuing education every two years after their first license renewal. This course meets the entire FREC-prescribed continuing education requirements. This course meets the “core law” and Ethics requirement, and the remaining units are selected “specialty education” sections. Topics includes the National Flood Insurance Program and more. This course is a popular, interactive approach to the 14-hour CE course, offering timely and critical information to licensees in short, lively chapters, with interspersed practice questions. The Forms-to-Go section makes important forms readily available to licensees. The final exam is a bank of 150 questions that is set to present five unique 30-question exams. Each question has a review link that simulates an “open-book” exam.